Polish is a West Slavic language of the Lechitic group. It is spoken primarily in Poland and serves as the native language of the Poles. In addition to being an official language of Poland, it is also used by Polish minorities in other countries. There are over 50 million Polish language speakers around the world and it is one of the official languages of the European Union. The Poles, commonly referred to as the Polish people, are a nation and West Slavic ethnic group native to Poland in Central Europe who share a common ancestry, culture, history, and are native speakers of the Polish language. The population of self-declared Poles in Poland is estimated at 37,394,000 out of an overall population of 38,538,000, of whom 36,522,000 declared Polish alone. Anti-communism is opposition to communism. Organized anti-communism developed after the 1917 October Revolution in Russia and it reached global dimensions during the Cold War, when the United States and the Soviet Union engaged in an intense rivalry. Anti-communism has been an element of movements holding many different political positions, including nationalist, social democratic, liberal, libertarian, conservative, fascist, capitalist, anarchist and even socialist viewpoints. Freedom and Independence was a Polish underground anti-communist organisation founded on September 2, 1945 and active until 1952. Narodowe Siły Zbrojne was a Polish anti-Nazi and later anti-Soviet military organization which was part of Poland's World War II resistance movement. The NSZ fought occupying German and Soviet forces as well as Soviet-allied Polish communist partisan forces such as Gwardia Ludowa and Armia Ludowa. Narodowe Zjednoczenie Wojskowe was a Polish anti-Communist organization, founded in November 1944, after collapse of the Warsaw Uprising. It was among the largest and strongest resistance organizations established in the Soviet-controlled Poland in mid- and late 1940s. The NZW consisted mostly of members of destroyed Narodowe Sily Zbrojne and disbanded Armia Krajowa. Similar Central and Eastern European anti-communists fought on in other countries that were occupied by the Soviet Union. The BBC World Service, the world's largest international broadcaster, broadcasts radio and television news, speech and discussions in more than 40 languages to many parts of the world on analogue and digital shortwave platforms, Internet streaming, podcasting, satellite, DAB, FM and MW relays. In November 2016 the BBC announced again that it would start broadcasting in additional languages including Amharic and Igbo, in its biggest expansion since the 1940s. In 2015 World Service reached an average of 210 million people a week. The English-language service broadcasts 24 hours a day. The Polish Committee of National Liberation, also known as the Lublin Committee, was an executive governing authority established by the communists in Poland at the later stage of World War II. It was officially proclaimed on 22 July 1944 in Chełm, installed on 26 July in Lublin and placed formally under the direction of the State National Council. The PKWN was a provisional entity functioning in opposition to the Polish government-in-exile, the internationally recognized government of Poland. The PKWN exercised control over Polish territory retaken from Nazi Germany by the Soviet Red Army and the Polish People's Army. It was sponsored and controlled by the Soviet Union and dominated by Polish communists. The Polish resistance movement in World War II, with the Polish Home Army at its forefront, was the largest underground resistance movement in all of occupied Europe, covering both German and Soviet zones of occupation. The Polish resistance is most notable for disrupting German supply lines to the Eastern Front, providing military intelligence to the British, and for saving more Jewish lives in the Holocaust than any other Western Allied organization or government. It was a part of the Polish Underground State. 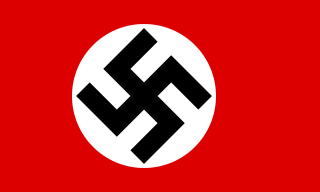 Poland was invaded and annexed by Nazi Germany and the Soviet Union in the aftermath of the invasion of Poland in 1939. 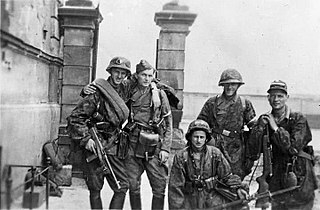 In the pre-war Polish territories annexed by the Soviets the first Soviet partisan groups were formed in 1941, soon after Operation Barbarossa, the German invasion of the Soviet Union. Those groups fought against the Germans, but conflicts with Polish partisans were also common. Leśni ludzie is an informal name applied to some anti-German partisan groups that operated in occupied Poland during World War II, being a part of Polish resistance movement. The first AK structure designed primarily to deal with the Soviet threat was NIE (short for niepodległość "independence", and also meaning "no"), formed in mid-1943. NIE's goal was not to engage Soviet forces in combat, but rather to observe and conduct espionage while the Polish government-in-exile decided how to deal with the Soviets. At that time, the exiled government still believed that a solution leading to Poland's post-war independence could be found through negotiations. The Polish Committee of National Liberation declined jurisdiction over former AK soldiers. Consequently, for more than a year, it was Soviet agencies like the NKVD that dealt with the AK. By the end of the war, approximately 60,000 soldiers of the AK had been arrested, and 50,000 of them were deported to the Soviet Union's prisons and prison camps. 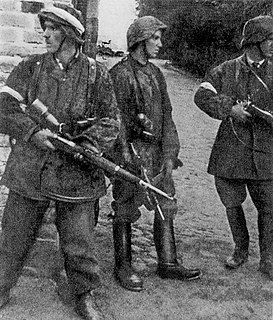 Most of those soldiers had been captured by the Soviets during or in the aftermath of Operation Tempest, when many AK units tried to cooperate with the Red Army during their nationwide uprising against the Germans. "The Giant and the Reactionary Spittle-Covered Dwarf". 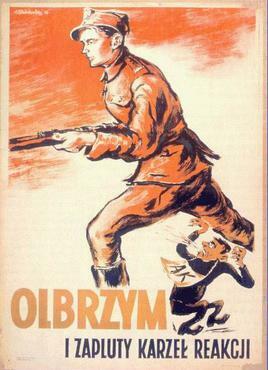 A postwar Polish communist propaganda poster showing a soldier of the Polish People's Army striding over a partisan of the Armia Krajowa (Home Army). Wolność i Niezawisłość ("Freedom and Independence", WIN) founded on September 2, 1945, active to 1952. Narodowe Siły Zbrojne ("National Armed Forces", NSZ) created on September 20, 1942, split in March 1944. Narodowe Zjednoczenie Wojskowe ("National Military Union", NZW) established in mid-to-late 1940s, active until mid-1950s. Konspiracyjne Wojsko Polskie ("Underground Polish Army", KWP) which existed from April 1945 to as late as 1954. Ruch Oporu Armii Krajowej ("Resistance of the Home Army", ROAK) formed in 1944 against UB collaborators. Armia Krajowa Obywatelska ("Citizens' Home Army", AKO) founded in February 1945, incorporated into Wolność i Niezawisłość in 1945. NIE ("NO") formed in 1943, active till 7 May 1945. Delegatura Sił Zbrojnych na Kraj ("Delegature of the Polish Forces at Home") formed on May 7, 1945, dissolved on August 8, 1945. Wolność i Sprawiedliwość ("Freedom and Justice", WIS) founded in early 1950s. Franciszek Andrulewicz,  his sister Janina and cousin Witold were also murdered;   and the family had already lost at least one relative at the hands of the Nazis. Mokotów Prison is a prison in Warsaw's borough of Mokotów, Poland, located at 37 Rakowiecka Street. It was built by the Russians in the final years of the foreign Partitions of Poland. During the Nazi German occupation and later, under the communist rule, it was a place of detention, torture and execution of the Polish political opposition and underground fighters. The prison continues to function, holding prisoners awaiting trial or sentencing, or those being held for less than one year. The Internal Security Corps was a special-purpose military formation in Poland under Stalinist government, established by the communist Council of Ministers on May 24, 1945. PodpułkownikJanusz Bokszczanin was a colonel of the Polish Army and one of the first Polish commanders of the motorized troops in the reborn Second Polish Republic. During World War II he joined the ZWZ resistance organization and later the Home Army. Until 1943 he served as chief of department of rapid response within its headquarters. In 1944, prior to the anti-Fascist Operation Tempest, he became the chief of operations, and deputy chief of staff of the entire Home Army (AK). The Belarusian Resistance during World War II opposed Nazi Germany from 1941 until 1944. Belarus was one of the Soviet republics occupied during Operation Barbarossa. Aleksander Krzyżanowskinom de guerre "Wilk" was a Polish army officer, colonel member of the Polish resistance movement in World War II and Commandant of the Armia Krajowa in the Vilnius Region. After the German withdrawal from the area, on July 17, 1944 Krzyżanowski had been duped by the Soviets into a fake debriefing, arrested and thrown in jail. He died in Stalinist prison on September 29, 1951, without a trial. The Augustów roundup was a military operation against the Polish World War II anti-communist partisans and sympathizers following the Soviet takeover of Poland. The operation was undertaken by Soviet forces with the assistance of Polish communist units, and conducted from July 10 to July 25, 1945 in Suwałki and Augustów region (Podlasie) of northern People's Republic of Poland. Anti-communist resistance in Poland can be divided into two types: the armed partisan struggle, mostly led by former Armia Krajowa and Narodowe Siły Zbrojne soldiers, which ended in the late 1950s, and the non-violent, civil resistance struggle that culminated in the creation and victory of the Solidarity trade union. On May 21, 1945, a unit of the Polish Home Army, led by Colonel Edward Wasilewski, attacked a Soviet NKVD camp located in Rembertów in the eastern outskirts of Warsaw. Hundreds of Polish citizens had been imprisoned at Rembertów including members of the Home Army and other members of the underground resistance. Prisoners at the camp were being systematically deported to Siberia. As a result of the attack, all of the Polish political prisoners were freed from the camp by the pro-independence Polish resistance. The Battle of Kuryłówka, fought between the Polish anti-communist resistance organization, National Military Alliance (NZW) and the Soviet Union's NKVD units, took place on May 7, 1945, in the village of Kuryłówka, southeastern Poland. The battle ended in a victory for the underground Polish forces. Mieczysław Kawalec, born in 1916 in the village of Trzciana, Rzeszów County, was a Polish resistance fighter. In the late 1930s, he graduated from the Law Department at Lwów University, and took the job of an assistant there. During the Polish September Campaign, he fought in the defence of Lwów, and in 1940 he joined the Rzeszów District of Union of Armed Struggle (ZWZ). Armia Krajowa Obywatelska was a Polish military anticommunist organization, and a successor of the disbanded Polish anti-Nazi resistance Home Army. It was founded in February 1945 by Colonel Władysław Liniarski, who had previously been commandant of the Białystok District of the Home Army. Organizacja Wojskowa Związek Jaszczurczy was an organization of Polish resistance in World War II. Created in 1939 and transformed into National Armed Forces in 1942, it represented the far-right of the Polish political spectrum and thus refused to recognize the Polish Underground State. The anti-communist resistance in Poland, also referred to as the Polish anti-Communist insurrection fought between 1944 and 1946, was an armed struggle by the Polish Underground against the Soviet takeover of Poland at the end of World War II in Europe. The guerrilla warfare conducted by the resistance movement formed during the war, included an array of military attacks launched against Communist prisons, state security offices, detention facilities for political prisoners, and prison camps set up across the country by the Stalinist authorities. Marian Bernaciak was a lieutenant in the Polish Army, a member of ZWZ and the Home Army, a major and a legendary leader of an underground partisan unit of WiN in the Lublin region. Franciszek Przysiężniak - was a lieutenant in the Polish Army, an officer of anti-communist resistance groups National Military Organization (NOW) and National Military Union (NZW). ↑ Atlas polskiego podziemia niepodległościowego 1944–1956, Warszawa–Lublin 2007, s. XXXIII. ↑ Sławomir Poleszak, Rafał Wnuk: Zarys dziejów polskiego podziemia niepodległościowego 1944–1956. W: Atlas polskiego podziemia niepodległościowego 1944–1956. Wyd. 1. Warszawa – Lublin: IPN, 2007, s. XXII–XXXVIII. ISBN 978-83-60464-45-8. ↑ Kostov, Chris (14 May 2015). "The Communist Century: From Revolution To Decay: 1917 to 2000". Andrews UK Limited – via Google Books. ↑ "Polish group sues Argentine paper under new Holocaust law". Reuters. 2018-03-04. Retrieved 2018-03-04. ↑ "1st of March - "Indomitable" Soldiers National Remembrance Day". www.msz.gov.pl. ↑ Tennent H. Bagley (2007). Spy wars: moles, mysteries, and deadly games. Yale University Press. p. 120. ISBN 0-300-12198-9 . Retrieved May 24, 2011. ↑ Presenter: Maria Margaronis; Producer: Charlotte McDonald (11 April 2019). "Poland's Partisan Ghosts". The Documentary Podcast. BBC. BBC World Service . Retrieved 11 April 2019. . The programme was rebroadcast on the BBC's domestic service Radio 4 the following week. 1 2 Review of Sowjetische Partisanen in Weißrußland, by Marek Jan Chodakiewicz, in Sarmatian Review, April 2006. 1 2 3 4 5 6 7 8 9 Andrzej Kaczyński (2 October 2004), Wielkie polowanie: Prześladowania akowców w Polsce Ludowej [Great hunt: the persecutions of AK soldiers in the People's Republic of Poland], Rzeczpospolita, Nr 232, last accessed 21 March 2016 via Internet Archive. ↑ Tadeusz Piotrowski, Poland's Holocaust, McFarland & Company, 1997, ISBN 0-7864-0371-3. Google Print, pp. 88, 89, 90. ↑ Judith Olsak-Glass, Review of Piotrowski's Poland's Holocaust in Sarmatian Review, January 1999. ↑ Henryk Piecuch (1996). Akcje specjalne: od Bieruta do Ochaba. Wydawn. "69". p. 116. ISBN 978-83-86244-05-8 . Retrieved 4 May 2012. 1 2 "Otwarcie wystawy "Zbrodnie w majestacie prawa 1944–1956" – Kraków, 2 lutego 2006". Instytut Pamięci Narodowej . Archived from the original on September 30, 2012. Retrieved June 1, 2011. ↑ Urząd Gminy Kuryłówka. "Kuryłówka village. Calendarium". Portal Podkarpacki. Retrieved May 30, 2011. ↑ Ireneusz Sewastianowicz; Stanisław Kulikowski (1990). "Part 10: "The Augustow Missing"". "Not Only Katyn". The Doomed Soldiers. 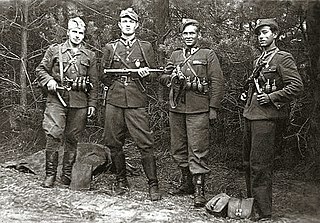 Polish Underground Soldiers 1944-1963 - The Untold Story. Białostockie Wydawn. Prasowe. ↑ Stankiewicz, Janusz. "Janusz Stankiewicz. Genealogia, przodkowie, badania genealogiczne, forum dyskusyjne". www.stankiewicze.com. (in English) WiN | Freedom and Independence - Historical Brief. (in English) NSZ | National Armed Forces - Historical Brief. (in Polish) ŻOŁNIERZE WYKLĘCI NA KRESACH POŁUDNIOWO-WSCHODNICH PO 1944 R.